8K vs 4K TV review – which is better? | What Hi-Fi? To answer that question, we’re pitting the 65in version of the 8K Q900R against the 65in version of Samsung’s flagship 4K TV, the Q9FN. 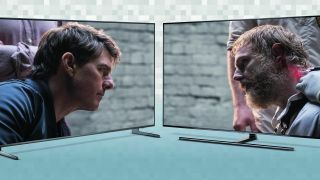 The former currently costs nearly double the latter, so clearly has an uphill battle but, according to Samsung, the 8K QLED TV should improve all content when compared with the native 4K QLED TV, thanks to clever, AI-based upscaling. And presumably, of course, at some point, the ability to play 8K content will be a huge bonus. But does that argument hold water? Time to find out. From the front, the two TVs are similar in terms of appearance, with both sporting the straight edges and pointy corners typical of the company’s recent models. The Q900R’s bezels are angled outwards, rather than inwards as they are on the Q9FN, and the Samsung logo has been relocated from the centre to the bottom right. The biggest difference is in the stands, with the Q9FN sporting an elegant pedestal while the Q900R gets rather more utilitarian feet. Those feet can be located either at the extremes of the Q900R’s bottom edge or closer to the centre, or can be tucked away into custom recesses in the back of the set for safe-keeping, should you choose to wall-mount. The Q900R’s uniform thickness and entirely flat back make it look rather like a chunky picture frame when mounted, while the Q9FN’s smooth tapering masks the fact that it’s actually just a touch thicker than its 8K sibling. Both TVs use Samsung’s One Connect concept, which sees all connections moved from the rear of the set to a separate One Connect box, with the two elements connected by a thin, semi-transparent cable. It’s an excellent feature but doesn’t offer a point of differentiation between these two sets – although Samsung says it will replace the One Connect box of the Q900R with one that fully supports HDMI 2.1, free of charge, if requested by the customer. The one big difference between the feature sets of the two models here is, of course, resolution. The Q9FN is a 4K set, with a resolution of 3840 x 2160, while the Q900R is 8K, with a 7680 x 4320 resolution – that amounts to quadruple the number of pixels. That’s not the only difference, though. While both sets have direct LED backlights with the same number of independently dimmable zones (roughly 500), the 65in Q900R has a peak brightness of 3000 nits, which is actually 1000 nits lower than its bigger 8K siblings, but 1000 higher than the Q9FN. The Q9FN’s 2000 nits already make it one of the brightest TVs available. Pushing all those extra pixels around also requires extra power, which is why the Q900R has a beefier processor than the Q9FN. The most important role of its Quantum Processor 8K is to upscale all of the non-8K content you’ll be watching for the foreseeable to match its native resolution. It does this in conjunction with Samsung’s server-located, machine-based AI upscaler, a version of which is coming to the company’s 2019 4K TVs, but the Q9FN does without. This, Samsung says, gives the Q900R an advantage over the Q9FN, even when playing non-8K content. Otherwise, the specs are more or less the same. Both have the same physical connections, including four HDMIs, three USBs and an optical output, and have the same exhaustive selection of apps, which includes Netflix, Amazon Video, BBC iPlayer and YouTube in 4K and HDR, the rest of the UK’s terrestrial channel catch-up apps, Rakuten and Google Play Movies and TV (4K but not HDR, despite the labelling of the latter), Now TV, BT TV, Plex, Spotify and Tidal. Whether either model will get the iTunes Movies app, which was recently confirmed as coming to Samsung’s 2019 sets, is yet to be confirmed. Both models also get Samsung’s Ambient mode, which allows the TV to blend into the wall around it, or display photos, art or live information when not in use as a ‘normal’ screen. They are also integrated with the company’s SmartThings smart home standard, so you can instruct your robot vacuum cleaner to start cleaning from the comfort of your couch, should you wish. There are no differences in the operating system, either, which is standard across Samsung’s whole range and is excellent. Snappy, intuitive, customisable and stripped-back in all the right ways, this is one of (if not the) best TV operating systems around. OLED vs QLED: which is the best TV technology? But the real crux of the matter is the differences in the picture performance, of which there are a few - though they aren’t mainly in the perception of resolution. Having watched hours of 4K, Full HD and even standard-definition content on both TVs, simultaneously and side-by-side, we can safely say there’s no discernible difference in the detail and definition of the two sets. In other words, the Q900R shows no obvious sign of its enhanced resolution. On one hand, that’s very impressive indeed – the Q900R is doing a huge amount of processing in order to upscale the video signals to its native resolution, and doing that without letting on is a real achievement. Certainly, the earlier batches of 4K TVs released were much worse than Full HD sets when it came to displaying Full HD content. On the other hand, it’s disappointing that the Q900R doesn’t improve this non-8K content in the way Samsung suggests it should. However, the AI Upscaler uses machine learning and should get better with time. So, while in six months time, the Q900R could well be upscaling 4K content beyond what a native 4K TV can manage, it isn’t able to do that just yet. Of course, the Q900R already does something the Q9FN never will: display native 8K content. Some may remain unconvinced that 8K is necessary, but having seen it in action on the Q900R (and a couple of other, pre-release TVs), we’re happy to say they are wrong. In our view, 8K is gloriously detailed and crisp, and that translates to an image that’s more three-dimensional and simply more life-like, even if you’re sitting at a typical distance from the TV (although the closer you are, the better it is). The problem is that there isn’t any publicly available 8K content (we’ve only seen demo content so far), or even a date when it might arrive, and so the fact that it looks awesome is no real advantage for the Q900R. Future-proofing is all well and good, but the vagueness surrounding 8K makes it hard to justify spending the extra for the feature. Who knows how long it might be before you could take advantage? But while you won’t be able to tell the difference in the native resolution of the two TVs when watching the same content, there are differences that you wouldn’t expect. The biggest of these is the colours, which are markedly paler on the Q900R. This is quite possibly an intentional move on Samsung’s part, designed to address suggestions that the vibrancy of the colours on its Q9FN should be tempered with greater subtlety. However, Samsung has gone a little too far the other way, with much of the vibrancy missing and a hint of greyness sneaking in, particularly with skin tones. It’s most noticeable when watching HDR content, which pops from the screen of the Q9FN and is just a little flatter and duller on the Q900R. The Q9FN’s colours might not be truly neutral (no TV's are), but we feel they’re closer than those of the Q900R and they’re much more appealing to the eye, and the result is that the Q9FN regularly offers the more enticing picture. Of the two sets, the Q9FN goes slightly blacker, but the Q900R offers the better balance of depth and dark detail – though it’s a close-run thing. Meanwhile, the Q900R’s extra 1000 nits of brightness isn't revelatory but is noticeable when it comes to whites, which are that little bit brighter, whiter and more dramatic. Viewing angles are more or less the same on both models – passable but some way short of the consistency of an OLED set. The Q900R is, marginally, better at handling motion, doing a slightly better job of sharpening without adding artefacts. There’s not a huge amount to choose between the two though, and a high-end Sony will be better than both. All told, both TVs are great, but the Q9FN draws the eye more regularly. That’s a real problem for the Q900R, which costs twice as much, particularly while there’s no native 8K content available to compensate for the slightly less attractive non-8K picture. Samsung has so far eschewed the recent trend for building TVs with integrated soundbars, but the essentially invisible speaker systems of the Q9FN and Q900R both produce surprisingly accomplished audio performances. In both cases, the Optimized mode is best. Once selected, both TVs produce a big, bold and spacious delivery with pretty clear, direct dialogue. Of the two, the Q900R is a little bit fuller bodied and more dynamic, but it’s not a night-and-day improvement worthy of spending the extra amount. What’s more, both TVs can be easily and cost-effectively improved through the addition of a separate soundbar. While there are differences in the picture performance of the Q9FN and Q900R, they’re not in the areas you might expect. Mist notably, the Q900R doesn’t let on that it’s an 8K set when watching non-8K content – there’s simply no advantage or disadvantage to those extra pixels. That would be fine if there were native 8K content to watch, but currently there isn’t, and so that leaves little reason to spend all of the extra money on the higher resolution TV. The actual differences are in the colours, blacks and whites of the TVs, and while the Q900R is slightly better in the latter two areas, the Q9FN is markedly better in the former, and its greater vibrancy and punch makes it the more enticing and exciting picture. So, with the Q900R’s 8K resolution being of no advantage for the foreseeable future and the Q9FN actually having the better colours, we’d recommend buying the Q9FN. Of course, once content starts coming through, you may find yourself wanting an 8K TV – but right now, the huge price premium on the Q900R is impossible to justify.